Last night, in the middle of the night, he was driving home on the highway and saw a deer get hit by a truck. Only its head was struck. My husband pulled over and waited for traffic to clear. Then he stopped his car in the middle of the highway, picked up the 180 pound animal and put it in his trunk. He drove it to his parent's house where he, his brother in law, and his father cut it up and put it into different bags. Now the freezer is filled with fresh meat. 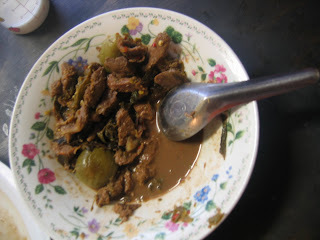 Cambodian friends were given meat, and mom cooked this wonderful dish, Salaw Mchew. Yum.